Well, that's one response I was not expecting! Not to my taste, frankly... but, as The Sandmonkey (among others) have pointed out, it shows an undeniable Jewish sense of humor about the whole cartoon kerfuffle (and the Muslim response to it). "We'll show the world we can do the best, sharpest, most offensive Jew hating cartoons ever published!" said Sandy. "No Iranian will beat us on our home turf!" Anyone want to take bets on the chances of a similar Iranian contest? And no, I have no intention of contributing to this contest. But I wish Amitai Sandy well. After all, the stated intent of the Iranian Holocaust-cartoon contest is to "prove" that the West isn't as devoted to free press as it claims. I enjoy the thought of showing that, yes, the Western world is willing to go a lot farther than Iran is. In an NPR interview on the subject, Amitai points out that the Iranians would never dare hold an anti-Arab cartoon contest... because they're lacking the self-confidence to publicly ridicule themselves (or their Muslim brethren in this case). 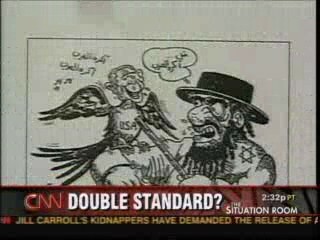 An Israeli antisemitic cartoon contest, on the other hand, barely qualifies as news!! Wow. What a crazy world we live in. And thank God for the crazies with a sense of humor. UPDATE II: Here's a great Dutch animation, titled "Gevoelig" ("sensitive"). Hat tip: Michelle Malkin. How is it possible that CNN does not see the blatant double-standard here? 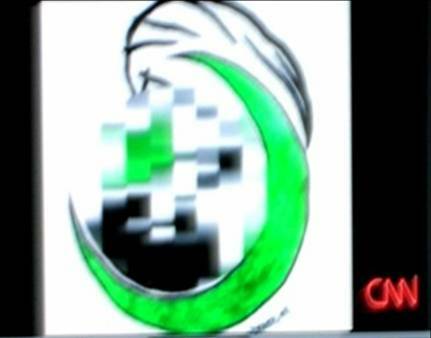 And how can CNN possibly justify this behavior to themselves, other than to admit that they are frightened of Muslims but not of Jews? And what does that admission do, to whatever shreds of journalistic integrity CNN might have left?